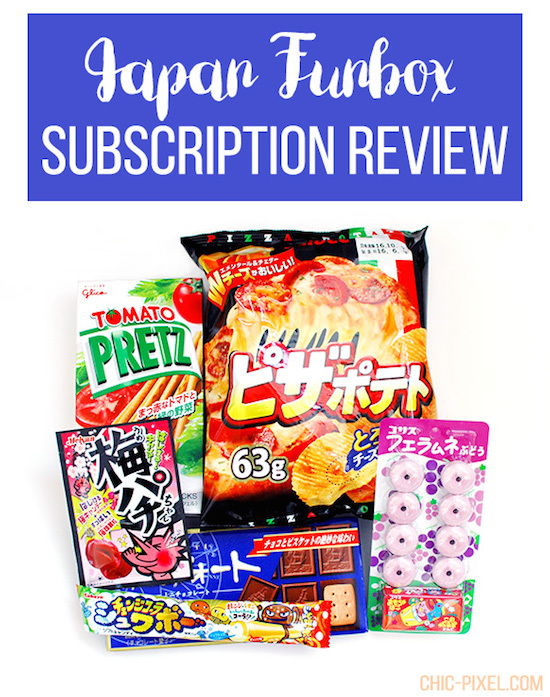 Japan Funbox is the latest Japanese snack subscription box on the scene, and when they approached me to review their Mini box for Chic Pixel, I couldn’t resist the chance to see how they stacked up to the other boxes on the market! Hereby let it be known that I will never pass up a chance to eat Japanese food. 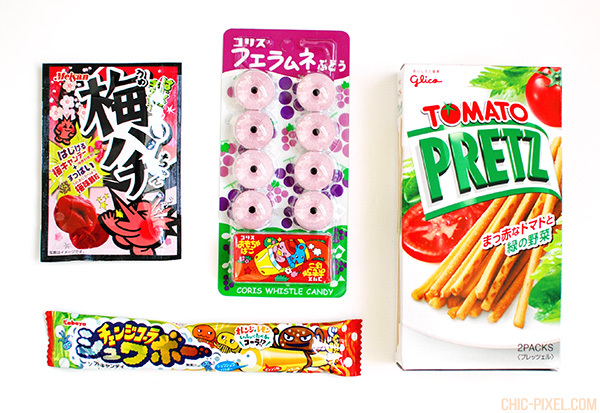 The Mini Japan Funbox offers 5 to 7 Japanese snacks and candy for $15 including shipping worldwide. Compared to the OyatsuBox Jr., which offers 3 to 4 treats and one gachapon for $12 but does not ship to all countries (including Australia), it’s a very comparable price. Read on to see a full rundown of what was included in my box! The first aspect of Japan Funbox I unfortunately have to critique is the lack of information on the items included – for those who don’t speak Japanese, it will be very hard to know what you’re eating. This may be okay for adventurous eaters, but makes this a difficult item to purchase as a gift for someone less familiar with Japanese food. Hopefully this is something Japan Funbox can look into including in the future! Update: I have spoken with Japan Funbox and this is actually something they normally include in their boxes, but unfortunately it was missing from mine. They sent a PDF version and I can confirm it includes both the names of the snacks as well as a description. In case you opted to skip the unboxing video, the above photo contains, from top left moving clockwise, ume popping candy, grape ramune whistle candies, Tomato Pretz, and a Change Cola Shuwabō candy. The ramune candies and Tomato Pretz are pretty standard Japanese snacks that I’ve had before but always enjoy, and the ume popping candy was certainly different than any flavor you can find here in Australia, but I was particularly thrilled by the Shuwabō candy! I mean, check out a close up of that awesome packaging! I just love these little jellyfish characters! The candy itself was a lemon and orange soda-flavored gummy stick with powder in the center. The packaging claims that if you eat the orange and lemon soda flavors together, it will taste like cola, but it didn’t really to me, actually! I don’t usually like soda-flavored candy, but the different flavors and textures in this one were really fun and surprisingly tasty. 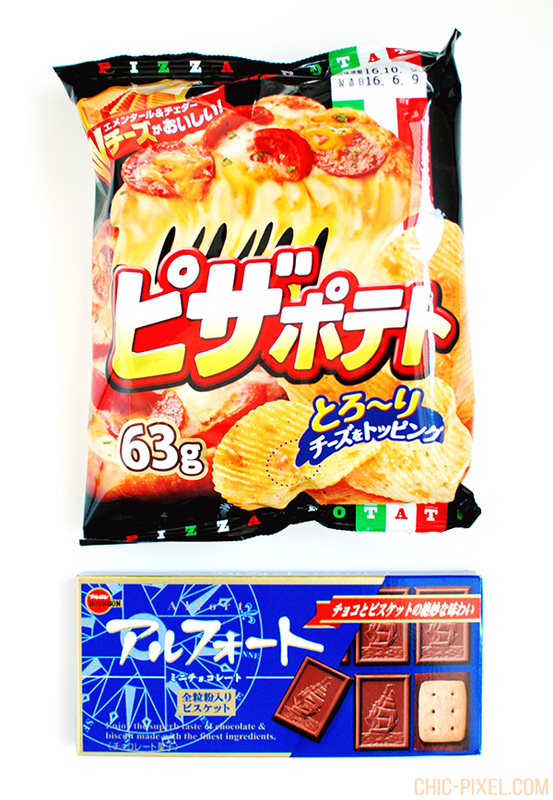 The Mini Japan Funbox also included pizza potato chips and Alfort biscuits. I used to eat Alfort fairly regularly when I was in Japan, and they’re just as I remembered! The thin, cracker-like biscuit is really nice when combined with the chocolate. The pizza potato chips were much more focused on the cheese flavor than other pizza-flavored chips I’ve tried that seem to highlight the tomato flavors more. At least, that’s how I’ll attempt to describe these chips, because they were much different from any pizza-flavored thing I’ve ever tasted! I’m not really sure I was that big of a fan, though – they really had a powerful yet oddly mild cheese flavor. It’s very hard to describe! Regardless of my feelings for the individual snack offerings in the Mini Japan Funbox, I was very impressed with the value for money of this box. They also have two additional box sizes to suit every appetite if 5 to 7 treats is less than what you’re looking for. 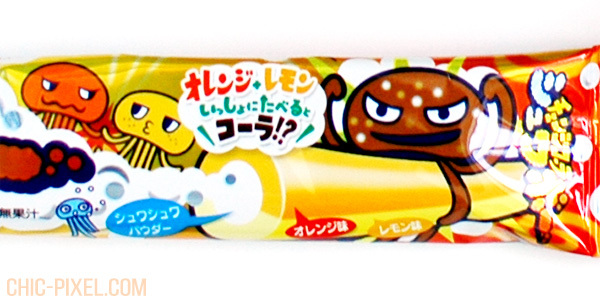 While the lack of at least a list of the names of the snacks included in the box is a shame, Japan Funbox offers a great selection of items for a very competitive price. Update: As noted previously, the box I was sent was missing the snack info, but this is something they usually include with all boxes. A sample Mini Japan Funbox was provided for the purpose of this review.